Peace Boat will visit the Port of Seattle, Washington for the first time on Tuesday, August 7, 2018 as part of its 98th Global Voyage. To celebrate the inaugural visit of the Peace Boat to the one of the most sustainable cities in the United States, Peace Boat will host a special event onboard the ship entitled “Sailing for Sustainability”, in collaboration with the Impact Travel Greater Seattle, Adventure Travel Trade Association and the Port of Seattle. Peace Boat is an international NGO in Special Consultative Status with the Economic and Social Council (ECOSOC) of the United Nations and associated with the Department of Public Information (DPI), and a key member of the 2017 Nobel Peace Prize-winning organization, the International Campaign to Abolish Nuclear Weapons (ICAN). Working on a social business model, its voyages create awareness, spur action and inspire positive social change. As a committed campaigner for the Sustainable Development Goals, since 2016 Peace Boat’s ship has been sailing with the Global Goals logo on its hull, promoting the United Nations 2030 Agenda and the Sustainable Development Goals, visiting nearly 75 ports-of-call around the world annually. 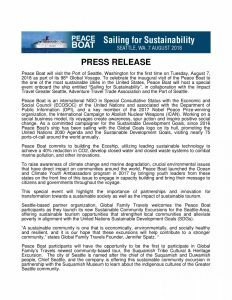 Peace Boat commits to building the Ecoship, utilizing leading sustainable technology to achieve a 40% reduction in CO2, develop closed water and closed waste systems to combat marine pollution, and other innovations. To raise awareness of climate change and marine degradation, crucial environmental issues that have direct impact on communities around the world, Peace Boat launched the Ocean and Climate Youth Ambassadors program in 2017 by bringing youth leaders from these states on the front line of this issue to engage in capacity building and bring their message to citizens and governments throughout the voyage. This special event will highlight the importance of partnerships and innovation for transformation towards a sustainable society as well as the impact of sustainable tourism. Seattle-based partner organization, Global Family Travels welcomes the Peace Boat participants as they launch its new Sustainable Community Excursions for the Seattle-Area, offering sustainable tourism opportunities that strengthen local communities and alleviate poverty in alignment with the United Nations Sustainable Development Goals (SDGs). Peace Boat participants will have the opportunity to be the first to participate in Global Family’s Travels newest community-based tour, the Suquamish Tribe Cultural & Heritage Excursion. The city of Seattle is named after the chief of the Suquamish and Duwamish people, Chief Seattle, and the company is offering this sustainable community excursion in partnership with the Suquamish Museum to learn about the indigenous cultures of the Greater Seattle community. Peace Boat will also organize a program to learn about ecological sustainability at the Beacon Food Forest, which aims to design, plant and grow an edible urban forest garden that inspires the Seattle community to gather together, grow their own food and rehabilitate the local ecosystem. Since 2008, Peace Boat has coordinated the “Global Voyage for a Nuclear Free World: Peace Boat Hibakusha Project”, inviting more than 170 Hibakusha (survivors of the atomic bombings of Hiroshima and Nagasaki) to travel onboard the ship, calling for a nuclear-free future. On this voyage, two Hibakusha (one from Hiroshima and another from Nagasaki) and one 2nd Generation Hibakusha are visiting 25 ports in 24 countries, where they are sharing their testimony as a means to call for nuclear abolition. These participants are also acting as “Special Communicators for a World without Nuclear Weapons” as accredited by the Japanese Government. In Seattle, the Hibakusha project is organizing a special study program to visit the B Reactor (part of the Manhattan Project National Historical Park), and Hanford Site to learn more about the history of nuclear weapons. Created as part of the top secret Manhattan Project during World War II, the B Reactor produced the plutonium used in the Trinity Test (the world’s first nuclear detonation) in July 1945, and the atomic bomb dropped on Nagasaki, Japan in August 1945, instantly killing tens of thousands of innocent civilians. It is vital that we spread the word about the devastating impacts of these weapons on humans and society. The Peace Boat Hibakusha project continues to raise the voices of the survivors of Hiroshima and Nagasaki for a nuclear-free world and encourage governments to ratify the Treaty on the Prohibition of Nuclear Weapons.